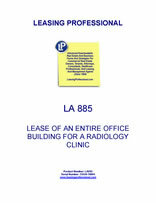 This Lease is made as of _________________, by and between COMMERCIAL PROPERTY LANDLORD, INC., a __________________ corporation ("Landlord"), and AGREEABLE MEDICAL TENANT, INC., a _________________ corporation ("Tenant"). 1.01. Landlord hereby leases to Tenant and Tenant hereby hires from Landlord, upon the terms hereinafter set forth, the entire office building ("Building") located at ____________________________ , together with all fixtures and equipment now or hereafter attached thereto (except items constituting Tenant's property), together with the underlying land and appurtenant areas ("Land") (collectively the "Demised Premises"). 1.02. The Demised Premises are described in Exhibit A annexed hereto, and the Building has a rentable area of _________ square feet. 1.03. The term of the Lease ("Term") shall commence _________ ("Commencement Date") and shall continue (unless sooner terminated pursuant hereto or by law) until __________ ("Expiration Date"). (b) additional rent ("Additional Rent") consisting of Landlord's costs of repairs to the Demised Premises, and any other reasonable costs incurred by Landlord in connection with the Demised Premises (except as otherwise provided in Section 4.01), as well as all costs and expenses relating to the demised Premises which are the obligation of Tenant. Additional Rent payable to Landlord shall be paid by Tenant on written demand. For default of Tenant in payment of Additional Rent, Landlord shall have the same rights and remedies as for a default in the payment of Net Rent. All Net Rent and Additional Rent payable to Landlord shall be paid, in lawful money of the United States of America, to Landlord at its office, or at such other place as Landlord may designate by written notice to Tenant. Rent for any partial month shall be prorated. 1.05. Provided Tenant is not in default under the Lease, Tenant shall be entitled to a Net Rent abatement in the amount of $_________ per month up to an aggregate total amount of $___________, said concession to be applied against the monthly installments of Net Rent due under this Lease for the first four (4) months of the Term. 2.01. Tenant shall use and occupy the Demised Premises only for radiological diagnostic facilities, a clinical laboratory and ancillary offices. Before the Commencement Date, Tenant shall obtain and furnish to Landlord a certificate of occupancy for the Demised Premises permitting the foregoing use. TENANT TAKES DEMISED PREMISES "AS IS"
3.01. Except for latent structural defects, Tenant shall accept the Demised Premises from Landlord in their condition "as is," with no obligation on the part of Landlord to do any fit-up work, alteration or renovation. Except as otherwise provided herein, Landlord makes no representation or warranty, express or implied, regarding the condition or state of repair of the Demised Premises and shall, under no circumstances, be liable for any patent or other structural defects in the Demised Premises or the improvements thereon or appurtenances thereto. Tenant has made a physical inspection of the Demised Premises and is satisfied with the condition thereof. Tenant assumes full and complete responsibility for the condition of the Demised Premises, subject only to Landlord's obligation with respect to structural repairs as provided in Section 13.01. 4.01. Except for Structural Repairs, Landlord will furnish no services, supply no equipment or materials, and make no improvements of any kind in or to the Demised Premises or any fixtures, appurtenances or equipment therein. All required services, equipment removal and electricity) shall be procured by Tenant at its sole cost. Tenant shall make the necessary arrangements directly with the utilities and pay all charges incurred. Landlord represents that all utilities are in place, connected and ready for use. It is the intention of the parties that the rents stipulated in section 1.04(a) shall be net to Landlord and that Tenant shall bear all costs and expenses of every kind and nature relating to the Land and Building, including, without limitation, real estate taxes for the Demised Premises, water and sewer charges, license and permit fees required for Tenant's use of the Demised Premises, and other governmental charges of every kind, imposed upon or relating to the Demised Premises, any part thereof, the use thereof, or any income of Tenant derived therefrom (collectively, "Impositions"). Tenant shall not be responsible for interest and principal payments on any existing or future mortgages placed by Landlord. Impositions shall be paid prior to the date penalties, interest or costs may be incurred for non-payment, but any penalties, interest or costs incurred shall be paid by Tenant.Landlord shall cause bills for Impositions to be issued directly to Tenant, who shall pay same on or before their due dates, and, within ten (10) days after each due date, Tenant shall submit a photocopy of each receipted bill to Landlord. 5.01. Tenant shall not suffer any waste or damage, disfigurement or injury to the Demised Premises. 6.01. This Lease shall be subject and subordinate to any mortgage or mortgages now or hereafter affecting the Demised Premises ("Superior Mortgages"), and to all renewals, replacements, extensions or consolidations thereof, provided such mortgage or mortgages contain a provision, or the holder of such mortgage or mortgages ("Superior Mortgages") agrees, in substance, that, so long as Tenant shall not be in default in the performance of its obligations hereunder in such manner and after such notice as would entitle Landlord to terminate this Lease, the Superior Mortgagee shall not disturb the possession of Tenant, terminate or attempt to terminate this Lease or join Tenant as a party defendant in any action brought for the foreclosure of such mortgage or mortgages or the enforcement of the mortgage debt. The non-disturbance form prescribed by the Superior Mortgagee shall be executed by the parties hereto, provided it contains, in substance, the foregoing provisions. (b) it has permitted such Superior Mortgagee a reasonable period within which to remedy such act or omission, which reasonable period shall in no event exceed thirty (30) days and they have not done so (or have not commenced to do so, if such act or omission cannot be remedied within such period, and proceeded diligently to remedy same). (c) bound by any previous modification of the Lease not expressly provided for in the Lease, or by any prepayment of more than one month's Fixed Rent, unless such modification or prepayment shall have been expressly approved in writing by the Superior Mortgagee. 6.04. If a Superior Mortgagee or a prospective mortgagee of the Land and/or the Building shall require minor modifications of the Lease as a condition precedent to granting a mortgage or an extension of a Superior Mortgage, Tenant shall, if requested in writing by Landlord, agree to such modification, provided they neither materially impair or restrict Tenant's rights or interests nor materially expand Tenant's obligations hereunder. Any dispute as to such a request for modification shall be determined by arbitration as hereinafter provided.